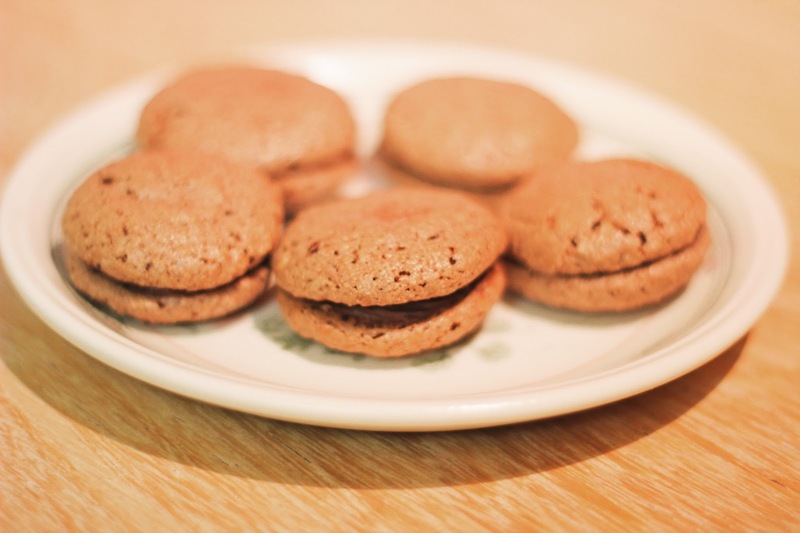 On Bake Off this week, it was Patisserie week so I decided to make macarons. I’ve never made (or eaten) them before, so I hope they look okay and taste good! I went for chocolate ones before I try out those pretty pastel ones. I found the recipe for them here. 1. Preheat the oven to Gas Mark 4/180C/160C Fan. Line a large baking sheet with baking paper. Sift the icing sugar and cocoa into a bowl, then stir in the ground almonds. Whisk the egg whites until they form stiff peaks, then fold them into the dry ingredients. 2. Fill an icing bag fitted with a plain nozzle with the mixture. Pipe 24 small blobs, about 3cm across onto the baking sheet, leaving a little space between each. Smooth the surface with a wet finger and then leave for 15 minutes to dry out. 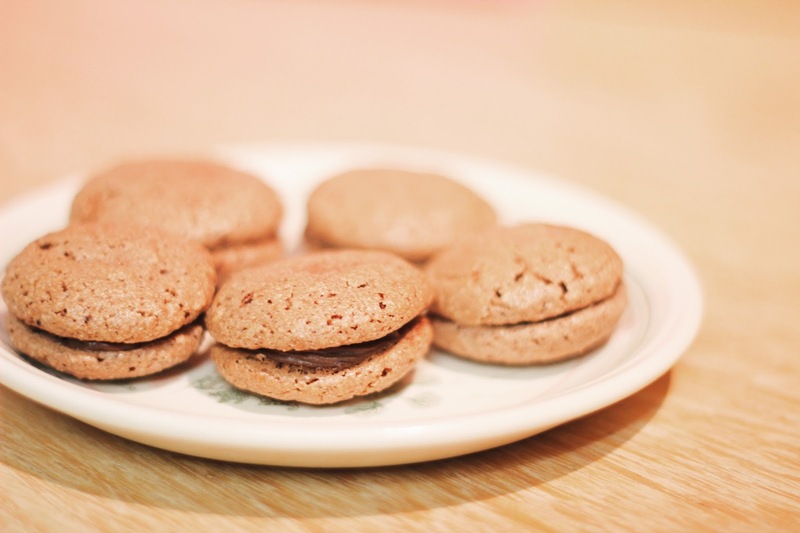 Bake for 15-20 minutes until the macarons feel firm to the touch and peel easily off the paper. Cool on the paper, then peel off. 3. To make the filling, put the chocolate into a heatproof bowl and melt. Stir in the warm milk until smooth. 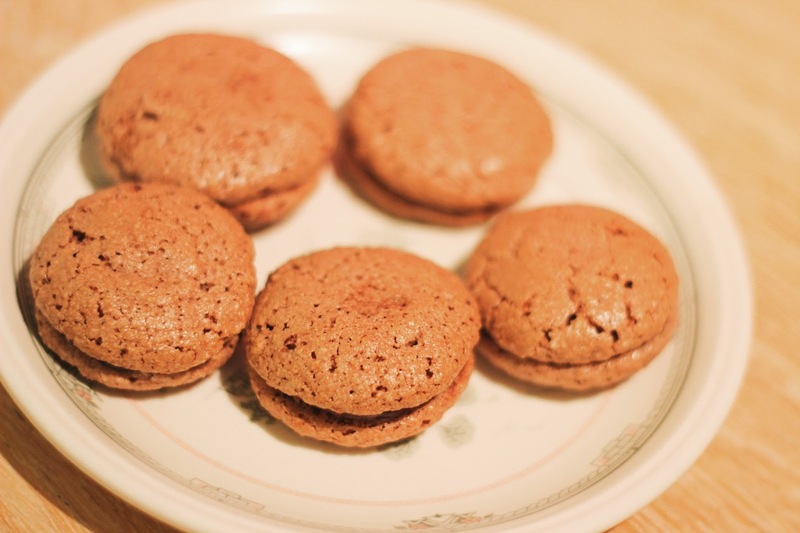 Leave to cool and thicken a little, then use to sandwich the macarons together.